If you use Gmail to receive the Cat Faeries newsletter, you should know Google is rolling out new features to their email service and they’ll be automatically filtering your past and future email messages. The Cat Faeries email newsletter will be categorized as “Promotions” and placed in a separate inbox. This may also happen to other emails from Cat Faeries, for example the emailed confirmation when you place an order or when we reply to a question you’ve asked us. This means you won’t see the Cat Faeries newsletter in your Primary inbox unless you change how the Gmail service handles our emails. Annoying yes! But fortunately, making the change is pretty easy. There will be five new inboxes – Primary, Social, Promotions, Updates and Forums. If you haven’t seen these changes yet, they will be coming soon. If you want to go back to having all your emails appear in one inbox (so you don’t have to check five of them), click on “Settings” in the upper right corner, then click on “Configure Inbox.” Unselect all categories but Primary and save your changes. You’ll have one inbox with all your email messages again. We hope this has been helpful to you. We love staying in touch! We’ve shown you “cat cafes” in Asia which you’ve loved. And many of you said that we need them here in the US. Well, it’s getting closer. Now there’s one in England! 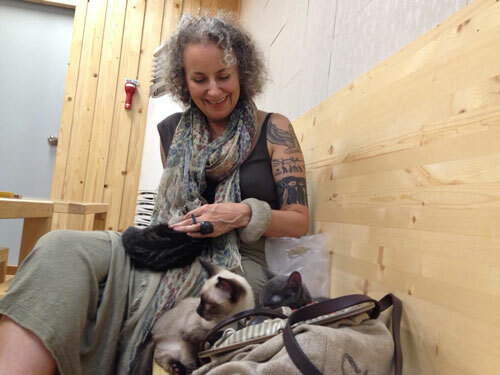 Wouldn’t you love to have to create a cat cafe in your community? What a service this would be to the health and well being of the human visitors. It would give cats “jobs” and a safe place to live. Talk about meaningful work! A cat café is the perfect mix of work and play, and service to cats and other people. Win-Win! Sass Brown, a favorite person of Madame Cat Faerie, is the assistant Dean at FIT (Fashion Institute of Technology) Department of Art and Design in New York City. Currently she’s in Korea for FIT’s Summer Program. Here she is having some feline fun and a cooling refreshment at the Cat Café in Songdo, Korea. Sass writes extensively about Eco-Fashion on her always fascinating and very inspiring blog: http://www.ecofashiontalk.com/ – be sure to check out her upcoming book “Eco Fashion” which blasts the concept that eco fashion clothes are scratchy, sacky, and ugly. An eco-fashion outfit with splotches of cat fur here and there is green and beautiful and tells the world you love your cat! Can a cat in mourning become aggressive? I purchased Past Abuse flower essence formula for my other cat and it worked beautifully. My male cat is having problems as I lost my husband a year ago and the cat really loved him. Now he is getting ornery and hard to get him to mind and he picks on the little female cat who is a lot smaller then he is. I need to get him calmed down. I’m so sorry to hear of the loss of your husband and that your cat is taking it so hard. This isn’t unusual as we know that cats do feel love and can bond very deeply with their favorite person. You wisely ordered Calm and Serene flower essence formula. We also recommend Forget Me Not which is our flower essence formula for bereavement. It will address grief, loss, abandonment, guilt, fear, and loneliness. It’s possible he blames the other cat for your husband’s “disappearance” from his world. He might also be afraid that he’s next to vanish or die. The two formulas used together should help him feel better, feeling safe and secure. You can use one formula in the morning and the other in the evening. Or one in his food and the other in the water bowl. And it’s perfectly ok for the smaller cat to consume the flower essences – she could use some calming down too! Bart’s inappropriate elimination ramped up. He is now 16 and hasn’t used a litter box for the past month. I don’t want to put him down for this! He is such a lover boy! Sometimes when a cat gets to be Bart’s age the kidneys are starting to shrink and not function as they once had. Shrinking kidneys lead to various stages of renal failure, and it’s time to begin diet changes, and often sub-cutaneous fluids. 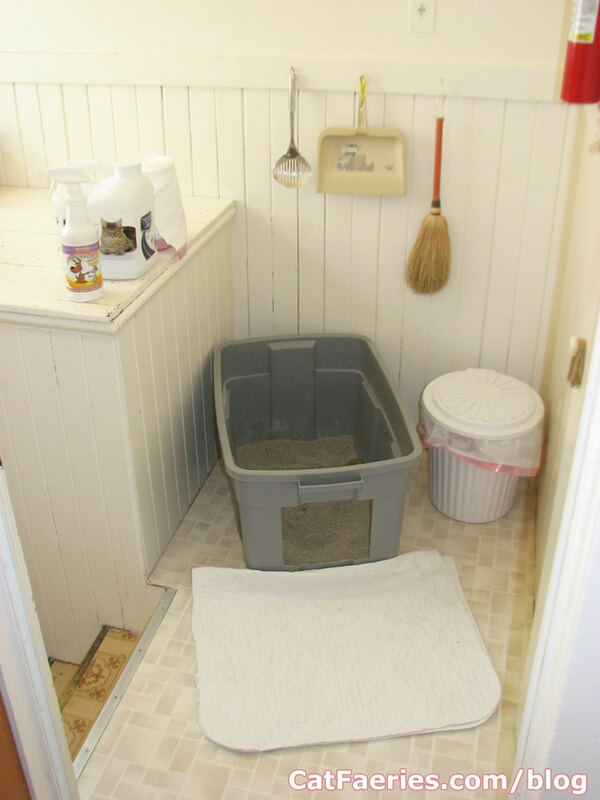 But what we often aren’t told is that it can lead to behavior changes including avoiding the litter box. So have your vet examine Bart and run some blood work. A few other medical conditions come into play as well. Arthritis is another big one for many cats as their back legs and lower backs become stiff and sore so that getting in and out of a little box can be painful – when that happens your cat might pee next to the box or on a surface like a bathmat. Or they can enter the box but they don’t squat – the urine flies out their back end and hits the wall or spills over the sides of the box. The solution for this is easy pie: a box that’s shallower for easy in/out access. Or even better, get a large storage container and cut out an opening that’s low enough for easy entry. The high sides are tall enough to contain urine that might be sprayed out. See below – that’s some of our washable waterproof pads in front of the box opening. This box is from Rubbermaid. Another option is a semi-transparent box such as those from Sterilite – some cats may feel less closed in that way. Another factor in renal failure is that cats often lose some or all of their hearing. This can lead to loud caterwauling both in the middle of the night and during the day. When a cat goes deaf their world can shatter and this can affect their behavior and out of panic or not understanding what’s going on with their body the cat could stop using the litter box. But the cat’s sense of smell is still very much intact, one of the many reasons we love Comfort Zone with Feliway so much. It works with your cat’s sense of smell. If your cat is feeling rotten from malfunctioning kidneys (it will feel like a hangover to your cat) or scared from not hearing well, Feliway will be soothing and comforting and allows that the negative behaviors can be corrected. You and your cat will be much happier with the smell of the Feliway pheromone wafting through the house. But don’t be concerned about the smell, only your cat can detect it. 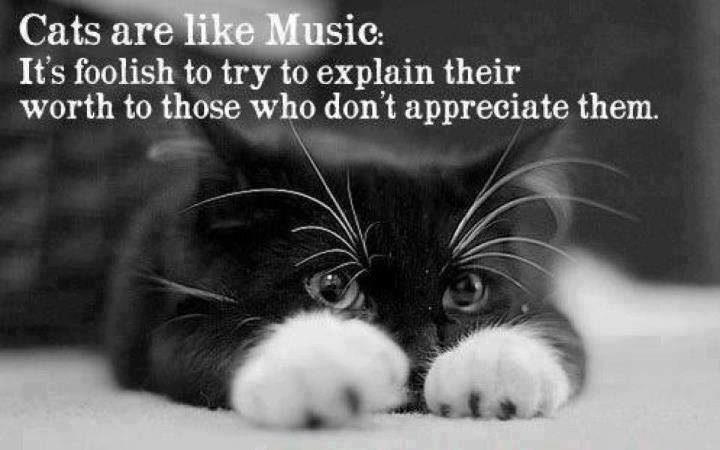 Words of wisdom that all cat lovers will totally appreciate. Thanks for another great find Tara! Ha Ha! 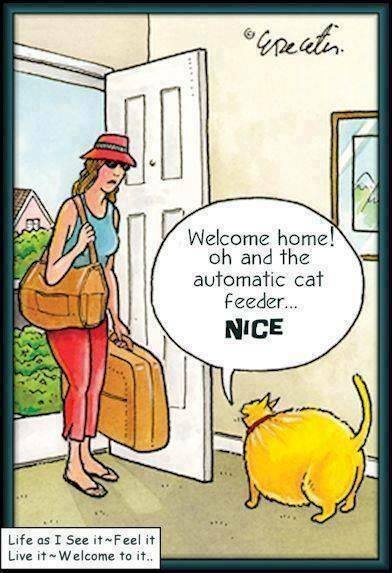 Really great cat humor from Tara. Do they really view us as The Cook, The Maid, The Butler?